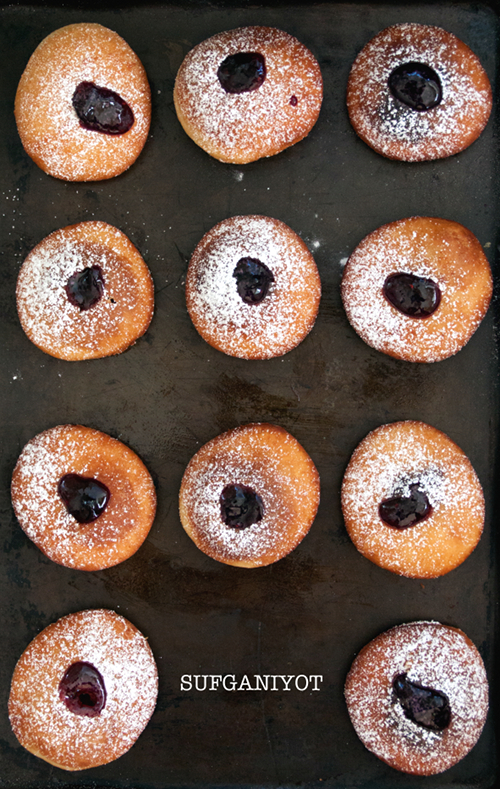 One does not need to be Jewish, Israeli, or even celebrate Hanukkah to enjoy Sufganiyot. 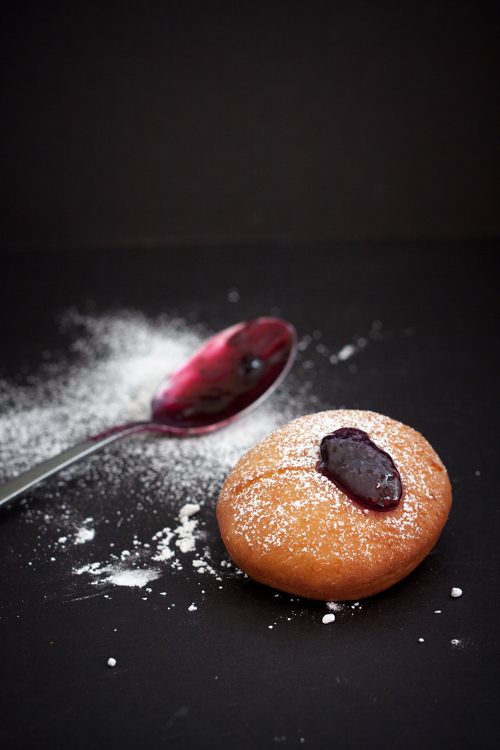 This Israeli version of jelly donuts is easy to make, light, fluffy, and most importantly, delicious. In a mixing bowl, combine warm milk, 2 teaspoons of sugar and yeast. Let stand for 5-10 minutes, until the mixture turns foamy. Add flour, salt, eggs, and the rest of the sugar into the bowl. Using your hands, mix the dough until well combined but still sticky to the touch. Add butter into the dough, continue kneading until the dough is smooth and elastic. Shape dough into a ball, transfer to a greased bowl, turn to coat. Cover the bowl with kitchen towel, store in a warm place in the kitchen and let rise until almost double in size. It should take about 1 to 1 1/2 hours. Transfer the dough to a lightly floured surface. 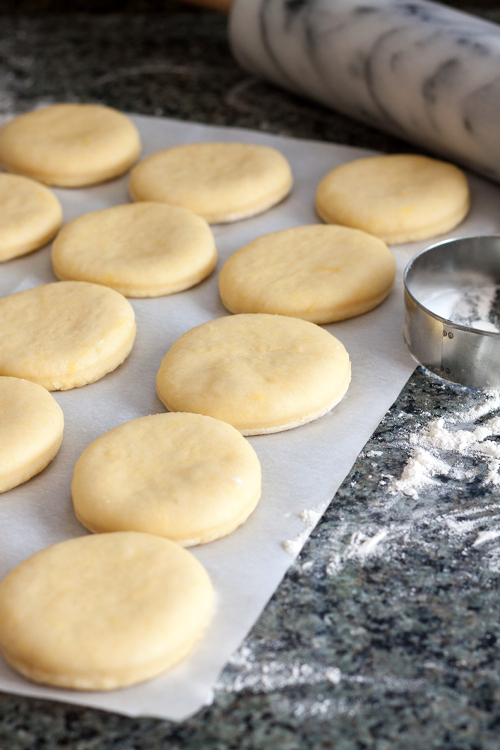 Punch down and then roll out the dough using a rolling pin, until it reaches 1/2-inch in thickness. Cut out holes using 3-inch biscuit/cookie cutter, place rounds on a line cookie sheet, 2 inches apart. You should be able to get about 24 rounds. Cover the cookie sheet with kitchen towel, and let rise for another hour. Place the oil in a frying skillet. Heat over medium heat until the temperature reaches 350 F. Fry 2-3 rounds in hot oil, about 1 minute each side, until golden brown. Transfer donuts to a cookie sheet lined with paper towel to absorb excess grease. Repeat the process with the remaining rounds. Place the jelly in a piping bag with 1/4-inch round tip. Poke a hole in the center of the donut using a sharp knife, squeeze the jelly into the donut through the hole. Repeat with the remaining donuts. Sprinkle with powdered sugar before serving.